Do you guys use shortcuts? I’d love to say that I don’t. That I have time to cook everything from scratch all the time, doctor and pick vegetables from my very own, well-cared for garden. But I live in a condo and a garden is out of the question. Also, I often don’t have the time to make my own. That’s why I find it very important to have a battery of no-fail shortcuts. My favorites? Canned beans, cartons of chicken stock and rotisserie chickens from Whole Foods. Now, I know that making your own beans and stock and chicken are all tastier options, but if I didn’t rely on these pantry staples, we’d likely eat dinner past midnight. Of course, since I bought myself some time by not roasting a whole chicken, I want to spend a little more time dressing it up. I made simple quesadillas with chicken, spinach and pepper jack cheese. On their own, they would have been dry and boring, so I brought a little bit of fall into the dish by making pear salsa with almost-ripe bartlett pears, red onion, jalapeÃ±o, cilantro and lime juice. 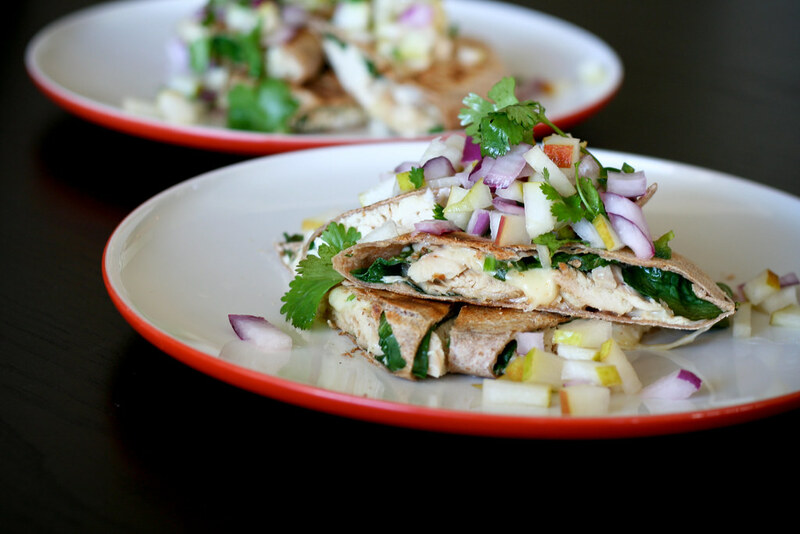 The result is a slightly sweet, spicy and crunchy topping that brings the quesadillas to life. A quick meal, but a really good one. What are some of your favorite shortcut meals? Combine all of the salsa ingredients in a bowl and set aside. Set a large (12-inch) skillet over medium heat. Place the tortillas on your work surface, brush the top with a little olive oil, then flip them over. Cover half of the non-oiled side of the tortillas with chicken. Divide the spinach equally over the chicken, making sure you’re only covering one half of the tortilla, then do the same with the pepper jack. Fold the tortilla in half, then carefully transfer two of them to the hot skillet. They should both just fit in the pan. Cook for 5 – 6 minutes on each side, or until the tortilla begins to brown and the cheese starts to melt. Carefully flip them and cook for an additional 5 minutes to toast the other side. Repeat with the remaining two tortillas. Cut each quesadilla into 4 pie-shaped pieces and place on a plate. Drizzle with crema (or sour cream) and top with heaping spoonfuls of pear salsa. Oooh, pear salsa! Maybe that can rescue me from my addiction to Trader Joe’s peach salsa. I am definitely going to try the pear salsa.. they sell Paul Newmans … that should give you an idea of the Mexican food ingredient choices I have . * cooked pasta .. I like shells, or anything that hangs on to the rest of the ingredients. I boil the pasta (sometimes in broth for more flavor. Drain, Put it aside to cool. Chop, dice everything and dump it all into a bowl, adding the pasta at the end. Toss it all together and serve with hot french bread. It seems like every time I click over here at the moment there is something that chimes exactly with my likes and favourites. This looks awesome! And yes, I love making things from scratch but shortcuts are a necessary part of life! I love this flavor combination! I’m always looking for ways to use fruit in savory recipes and can’t wait to try the pear salsa. This may not quite qualify as a shortcut, but I make a big pot of stock every 2-3 months and then premeasure the stuff into individual baggies (I make sure to let it cool before ladling.) I then freeze the baggies and thaw one whenever I need one. (Note: I let them thaw in the refrigerator or pry out the frozen stock before microwaving — I wouldn’t advise microwaving plastic bags.) The extra work is worthwhile to me because homemade stock is tastier and cheaper, and I end up wasting less than when I buy cartons at the store. Always make more rice than you need. I did this last week and cranked out a bunch of burritos for the freezer for work lunches, then had the leftover rice on hand to heat up quickly and conveniently for some eggplant and chicken in garlic sauce (got two meals out of that one) and last night for a quick dinner of chicken and mushrooms in spicy thai peanut sauce before heading out. Pears in salsa is terrrific and wonderful with any melted cheese. This looks amazing. I just found your site and am very excited to follow! Keep up the cooking! Just made this tonight and it was delicious. Hello. Are you aware learning to make a website smartphone warm and friendly? I’m trying to find a concept or plugin that could possibly fix this problem. Please share if you have any suggestions. Swift issue that’s entirely from matter. My web-site looks odd when surfing.